The building is available for community usage and we can cater for a range of events, regular classes/groups and other services depending on your requirements. Car parking is available locally. If you are seeking to hire the venue for an event, meeting or social group please contact us, using the link below. Once your booking has been made you will receive a booklet detailing the key information about hiring the hall/venue. We ask all users of the facilities to leave them in the condition they found them and no alcohol is allowed on the premises at any time. Please click here to make an enquiry via our simple form. 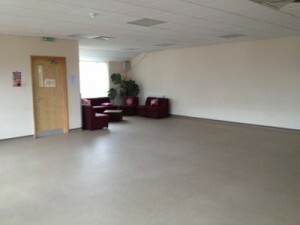 The rooms that are available for hire are listed below with specifications and further details. The largest of the venue space for hire is the main hall which offers a large open space (Capacity: 100-120) which can be used for various functions. 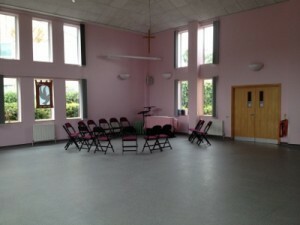 Use of the tables (various sizes) and seating is included in the hall hire. The kitchen is available to use as part of any function room hire and has two counters to serve food/drink through, an oven, gas range, sink and separate hand washing basin. 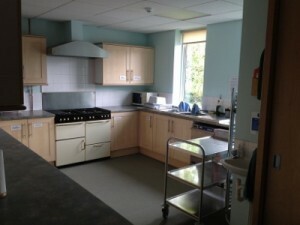 Various items of cutlery, cooking equipment (pots, pans etc) are available with ample refrigeration provided. Note: We ask that any food you keep refrigerated is disposed of or taken with you when you leave. This smaller meeting room is located on the ground floor of the property and features comfortable seating, coffee tables and an ideal space for smaller groups to meet. 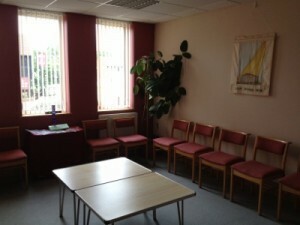 A larger meeting space with comfortable seating area and a selection of tables/chairs to use. Ideal for medium sized groups to meet and use as an activity space. Access is via the main staircase from the front reception area and escape access is provided by a separate fire exit.